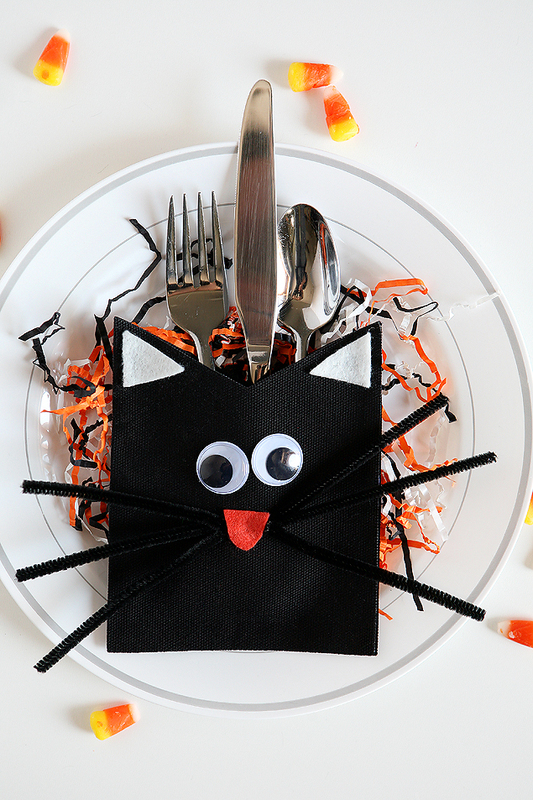 We have a super simple Halloween craft for you today! 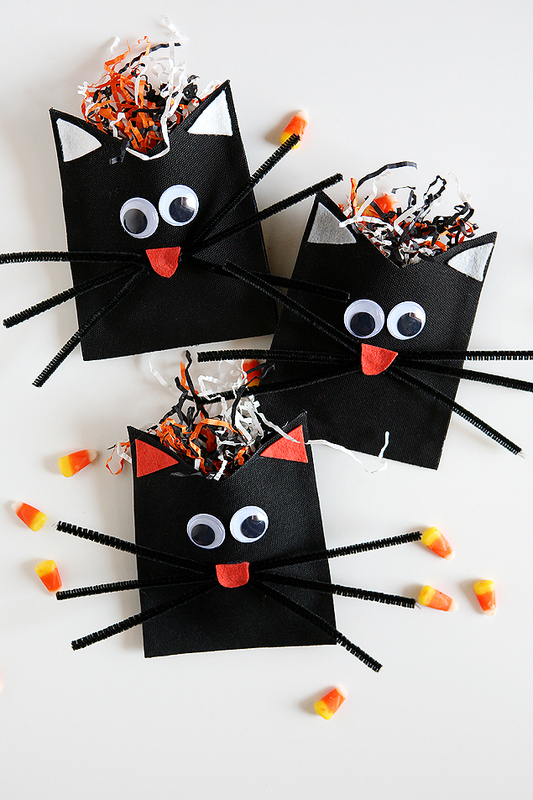 If you’re a lover of black cats, Halloween or just having an excuse to be creative, these are for you. Plus, there are so many fun things you can do with them. Please tell me, have you ever seen a cuter black cat? Bonus! These kitties won’t even make you sneeze. If you want to get help from the kiddos (switch out the hot glue for some craft glue) they would make for a perfect family night craft. Grab two banners and hot glue down both sides and the bottom. Once your little black cat pocket is dry, cut two triangles to fit in the ears and a little mouth. Put three pipe cleaners next to each other and give them a few twists in the middle. Making it so they don’t come apart from one another. Now you are ready to hot glue the ears, eyes, the pipe cleaner whiskers and the mouth on top. Could not get any easier, right? These little guys make the perfect utensil holders for your Halloween party or to make dinners during the month of October a little more special. Or, fill them full of treats or a small gift. Friends and teachers are sure to get a kick out of them. We know several families that trade their kids Halloween candy for a small gift. 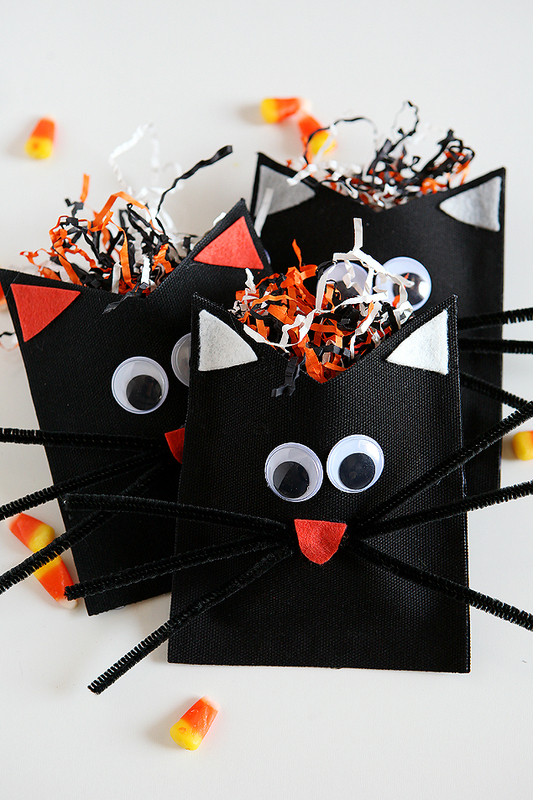 These would be really cute to leave out for them with a gift card to their favorite store or eatery, in exchange for their Halloween loot. Don’t you think? We hope you love them as much as we do and would love to hear (and see) what you end up doing with them!